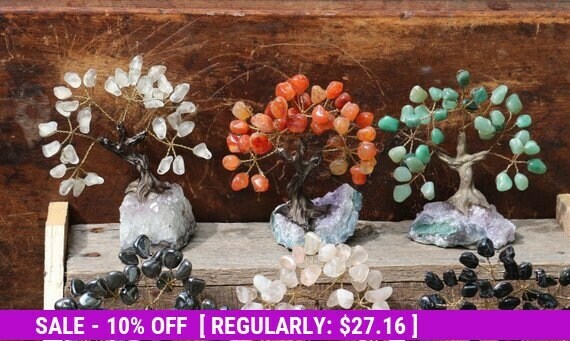 Small Crystal Bonsai Tree | Small Crystal Wishing Tree, Many Variations in Stock! 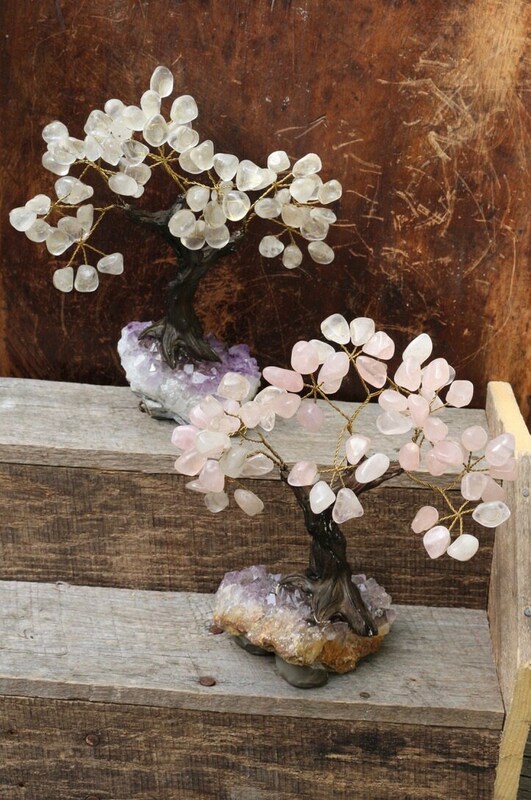 Small sized Crystal "Bonsai Trees", also known as Crystal Wishing Trees. These beautiful, and so special "works of art" are individually hand-made by a friend of a friend who lives in Brazil. 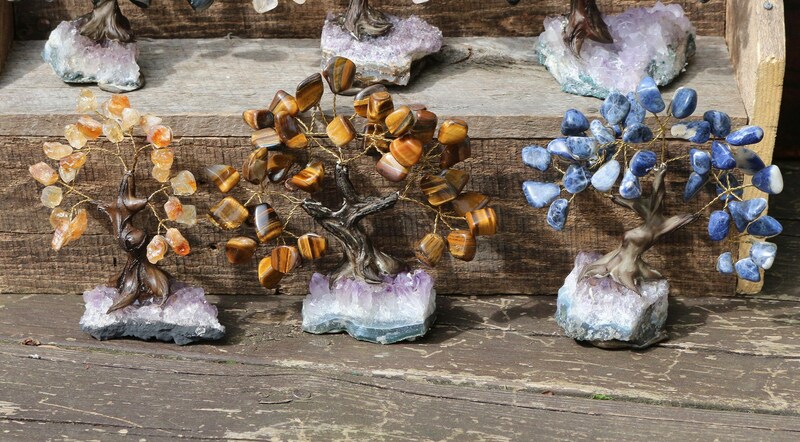 She spends her days sitting on her shady porch making different size and types of "Bonsai Tree" sculptures from various crystals. Place one on your desk, on a nightstand or a sunny windowsill. They are awesome little trees that are filled with good mojo!! Talk about the perfect gift for just about anyone! Below are the APPROXIMATE dimensions for the "SMALL" sized Bonsai Tree. Amethyst Druzy Base: W 2.5" x D 2" x H 1.5"
The Crystal Bonsai Tree otherwise know as the "Wish-Granting" Crystal Tree is one of the more popular items in the Feng Shui toolbox. People believe it has the power to bring consistent profit and long lasting wealth. 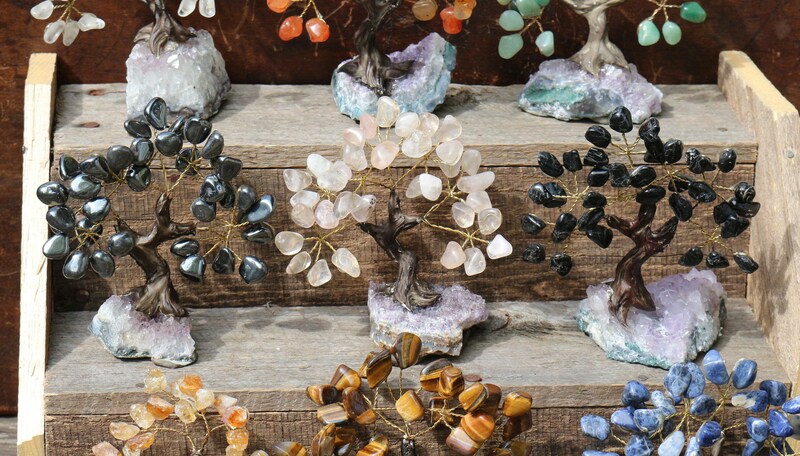 Created with small, tumbled various types of crystals, it is believed that the crystals can deflect and neutralize bad energy that would interfere with your success. 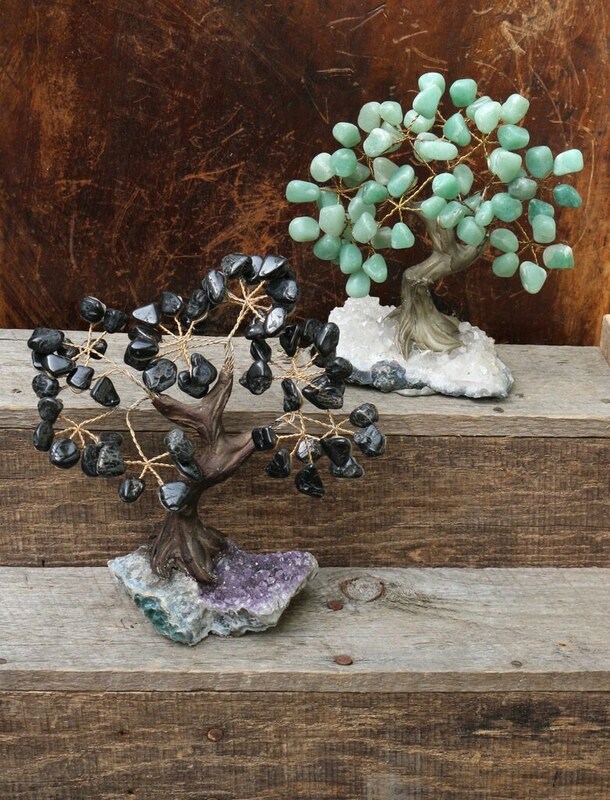 The Crystal Bonsai Tree is a replica of the traditional Chinese “Wishing Tree.” These trees are placed on desks or tables to wish for increased luck, wealth, and fortune. According to legend, the Crystal Tree was created by a fairy that fell in love with a village boy. She planted this wealth-producing tree to ensure their everlasting happiness and comfort. 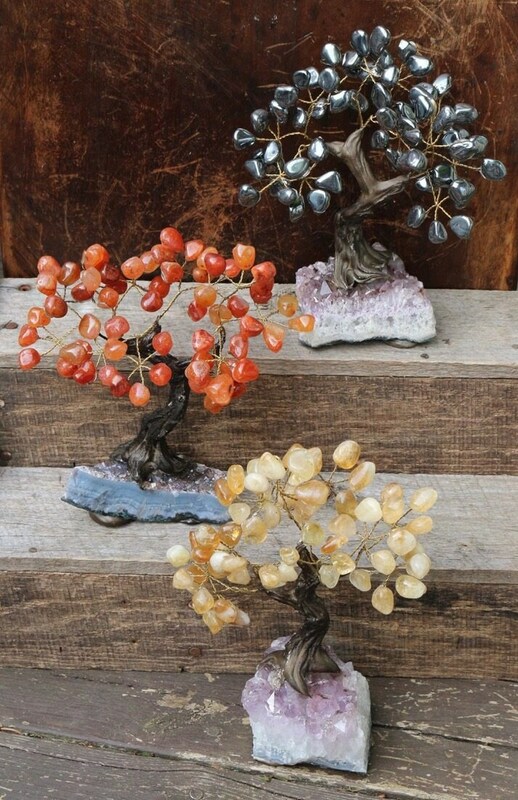 This started not only the belief in Feng Shui crystal trees attracting wealth but the traditions of leaving wishes written on slips of paper that are hung or placed near a wishing tree to bring good fortune. Below is a list of the traditional placements for the Crystal Bonsai Tree that are supposed to increase certain types of luck and fortune in your life. Crystals and crystal trees are said to enhance healing energies and focus energies in positive ways. Many people using them as a focus object for meditation and find their visual presence to be calming. Amethyst is a natural stress reliever that encourages inner strength and brings wealth and a keen business sense to its wearer. It is a crystal of spiritual growth and protection. It brings clarity to their owner and helps one to become more in tune with their feelings. Amethyst Crystals repel negative energy and attract positive energy, making them an excellent protection stone for the home. Black Tourmaline has a calming effect when needed, grounding flighty or scattered energies into the earth. Those who face challenges from negativity, frequent worrying, and/or OCD can work with Black Tourmaline to help heal these issues. Carry a piece of Black Tourmaline in your pocket to increase physical vitality throughout your day. Meditation with Black Tourmaline can enhance the integration of insights and visions into one's daily life. Black Tourmaline is associated with the Root Chakra. Sodalite is a stone of logic, rationality, and efficiency. It is helpful for work in groups and stimulates thought. Sodalite is a stone that is good for healing breaches in communication. It is a stone of truth and brings this to all communications. It is called a Poet's Stone. It can help end arguments or other disagreements. It is particularly useful for being honest with one's emotions and love. It increases intelligence, knowledge, and learning, and can unite the logical with the spiritual. Physically it is said in folklore and crystal healing to be beneficial for the glands, diabetes, digestive system, lymphatic cancer, relieving insomnia, and decreasing calcium deficiency. It is also used in crystal healing for a quicker relief of head colds. Sodalite is associated with the Throat and Brow Chakras. Carnelian is a stone of action and may give you the courage and confidence to move forward on a new path in life. The vibration of this bright orange stone, will accelerate your motivation, and aid you to clarify your goals so that you can find your best direction in life. It assists in moving forward on a new life path and will help you to make new, clearer decisions and better future career choices. Used as a professional support crystal, Carnelian aids architects, builders and construction workers in their creation of master buildings, stimulates power and stamina in athletes and military personnel, establishes form and organization in journalists, and stimulates motivation in salespersons. Carnelian clarifies the voice. It is the Singer's Stone. It also promotes confidence for performances on stage or in live media. Carnelian is traditionally known to guard against falling masonry and accidents with tools. Today it guards the home against theft, fire, storm or disaster. Carnelian is also placed on top of the moulding of all doors as a protector and an as an invitation for good things to enter the room. Carnelian is associated with the Sacral Chakra. Citrine is a stone of light and happiness. It does not hold any negative energy and therefore never needs to be cleansed. It brings clarity to those who wear it (as jewelry or carrying in your pants pocket) and helps to manifest anything you want to bring into your life. It activates your imagination, bringing more creative visions to a clearer mind and a more positive outlook on life. Powered by the Sun, Citrine warms, cleanses and energizes the body, energizing and strengthening the solar plexus. Citrine is an especially lucky stone for business. Clear Quartz is the most versatile healing stone among all crystals. Quartz is the most powerful healing stone of the mineral kingdom, able to work in any condition. Clear Quartz is known as the stone of power and amplifies any energy or intention. Clear Quartz is often used to cleanse, open, activate, and align all of the chakras. Hematite crystals have an excellent grounding and balancing energy, as well as being a powerful aid to stimulate the mind. They enhance memory and evoke deep thought. They have highly protective power and are good to help women who lack courage. If you desire to stimulate your mind for higher learning, they are most helpful, especially in the field of mathematics and technical studies. They will assist in the development of logical thought processes, and help you to reach the highest capacity possible. They will heighten self-confidence, willpower, and self-esteem. The energy of these stones has strong physical grounding energy. Hematite is associated with the Root Chakra. Jade/Nephrite is considered to be good for emotional balance and stability. Nephrite jade is related to the heart chakra and has a beneficial effect on all heart chakra related issues and all love relationships. Jade of all kinds is a very protective stone and is particularly useful protection for children, against illness, and for psychic protection. It has dynamic clearing properties and is helpful to keep with other stones. Physically, nephrite jade is used in the crystal healing of the physical heart, and kidney problems. Jade is associated with the Heart Chakra. Rose Quartz is the stone of unconditional love. It is one of the most important stones for Heart Chakra work, as it opens that heart to all types of love—love of the self, love of family, love of friends and romantic love. The soothing energy of Rose Quartz fosters empathy, reconciliation, and forgiveness of others, lowering stress and tension of the heart. It can assist in leaving anger, jealousy, and resentment towards others, allowing the healing of heart issues caused by holding onto these negative emotions. Tiger's Eye is a powerful stone that aids in harmony and balance and helps to release fear and anxiety. It stimulates taking action, and helps you to make decisions with discernment and understanding, and unclouded by your emotions. Traditionally it was carried as an amulet against curses or ill-wishing and is known to give you courage, self-confidence, and strength of will. Lions, Tigers, and Courage are synonymous! Tiger's Eye is associated with the Root Chakra, as well as the Third Eye Chakra. What a wonderfully packaged and delightful purchase! I bought this as a gift and the packaging, notes and little surprise make it extra special. I will order from Alyssa and SoGoodMojoCo again! Lovely proprietor and lovely products! Great quality. Fast Shipping. Really enjoying my crystal bonsai tree. I love my new bonsai tree! And their little extra gift was such a pleasure, especially because it's my birthstone!